As a wholesale sign manufacturer we are often talking about our standard sign face products, however we also do work outside of the sign industry and wanted to take a moment to talk about our thermoforming capabilities for other industries. One recent project we did consisted of fabricating the Cargo Wave for PN Products Incorporated. 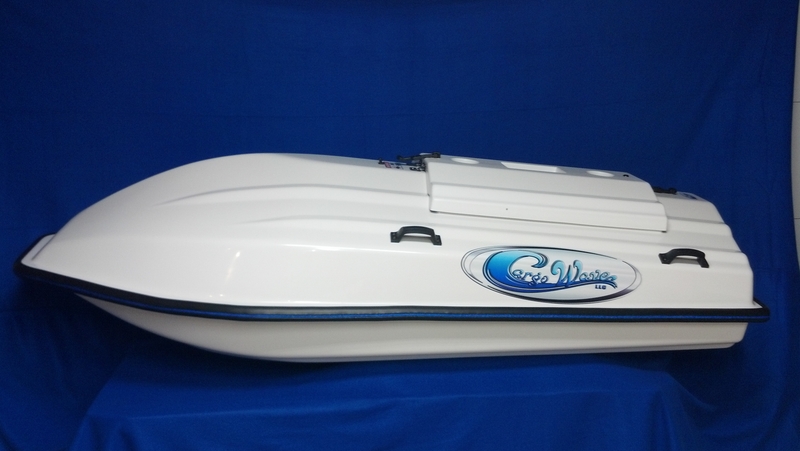 This is a towable storage boat that allows users to easily transport their items behind jet skis, kayaks, canoes, inflatables, boats, ATVs, snowmobiles, and more. This project highlights our custom thermoforming abilities as we can create an impressive array of forms, including plastic domes or hemispheres as well as custom plastic parts for the boat or auto industry. Our company has the ability to turn your drawing into a reality and our capabilities include custom plastic thermoforming with 3D draw up to 48 inches, single piece and prototype production, custom plastic cutting, plastic forming, plastic bending, and acrylic plastic gluing. We can also work with polycarbonate, chrome acrylic, cast acrylics, white plastics, and Acrylonitrile Butadiene Styrene (ABS) plastic. To learn more about our thermoforming capabilities and to view past projects, visit our website. We can also be followed on Twitter and LinkedIn for company updates and industry news. This entry was posted in Plastic Industry, Thermoforming and tagged plastic thermoforming, thermoformed parts, thermoforming capabilities, wholesale sign manufacturer. Bookmark the permalink.